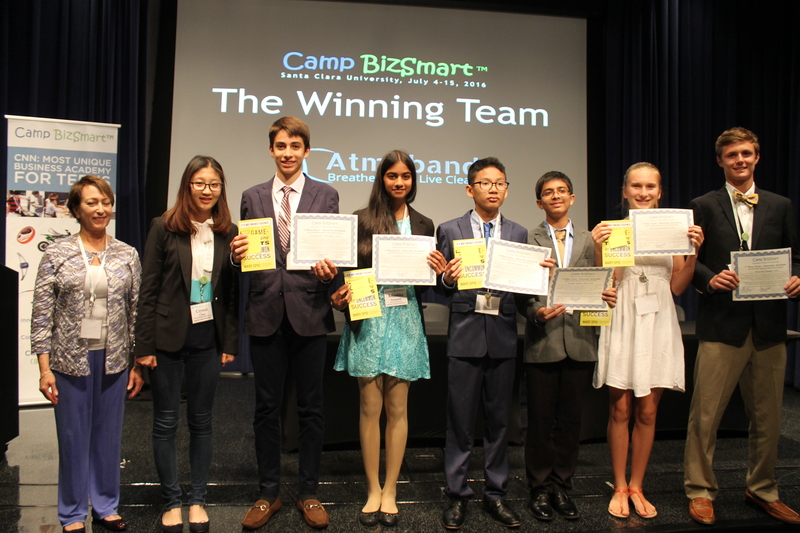 Congratulations goes to the Camp BizSmart grand champion team, Atmoband, whose team members are: CEO, R.J. Faltinsky; CFO, Max Stengel; CMO/VOC, Nirmik Tambe; CTO, Anh Nguyen; CSO, Beatrice Mihalache; and CIO, Anushka Narasani. The Atmoband team selected the Atmotube product innovation case to solve out of four possibilities, and came out on top following the five Camp BizSmart competitions held at Microsoft, Silicon Valley this past summer. They will be honored on stage at the Keiretsu Forum’s Angel Capital Expo on November 17, 2016, at Microsoft, 1065 La Avenida Street, Mountain View, CA. 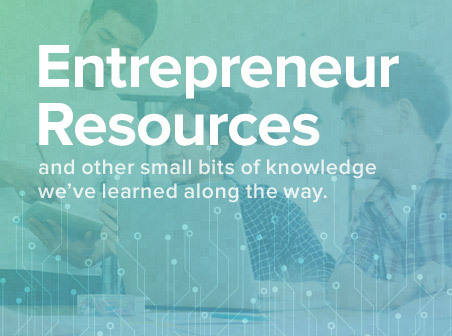 Keiretsu has been a strategic innovation partner of Camp BizSmart since 2008. Marla Zemanek, Camp Director and Crystal Chen, coach, with Atmoband team members: CEO, R.J. Faltinsky; CFO, Max Stengel; CMO/VOC, Nirmik Tambe; CTO, Anh Nguyen; CSO, Beatrice Mihalache; and CIO, Anushka Narasani. 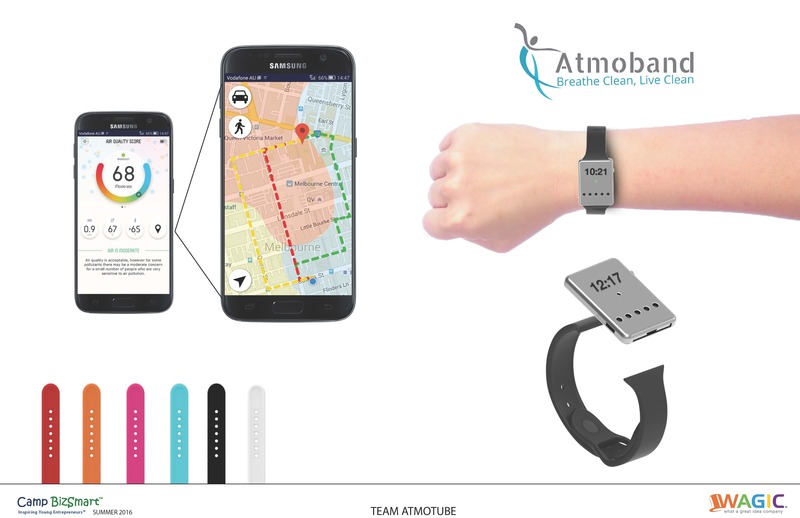 Team Atmoband chose to solve the business case provided by Camp BizSmart Innovation Partner, Atmotube. Vera Kozyr, the CEO and Founder of Atmotube, was a Camp BizSmart 2016 Product Innovation Partner, challenging Camp BizSmart student teams to create the next generation air pollution monitor to collect data to make informed choices about access to clean air. 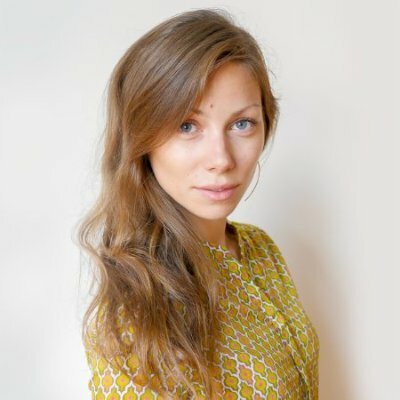 The objective of the product design and business pitch competition being to gain essential skills of problem solving, critical thinking, collaboration and team work, as well as leadership, communication and project management all while creating hands-on a new product innovation to solve a real world problem working with leading company founders. 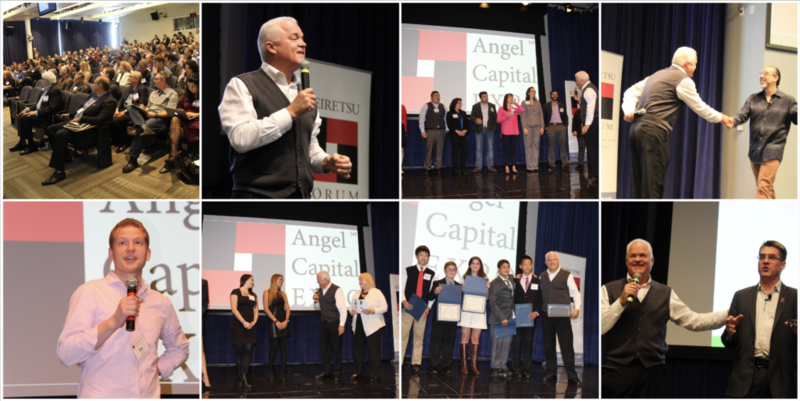 Photos from last November’s Angel Capital Expo including the photo of the 2015 Camp BizSmart Grand Champion Team, appearing on stage with Randy Williams.